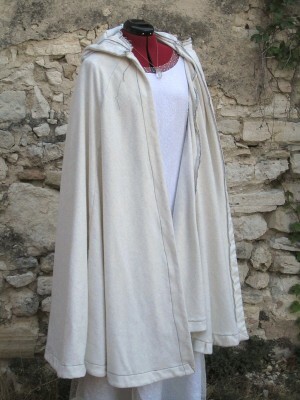 Here is my White Wizard costume from the Light Order for a LARP event in the Warhammer universe. A white wizard is dressed in white ! It doesn’t change much from my Priestess Shallya dress … Especially since it’s the same character who has just changed careers. This has greatly facilitated this costume since I reused the same white dress (McCall’s 4491 pattern). 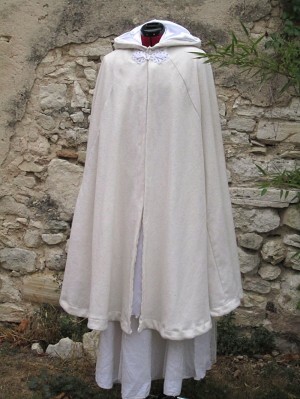 I only had to make a surcoat, sleeves and as my friend Ben has kindly lent me a white cape, to adapt the cape a bit. A White Wizard from the Light Order has to be luminous. 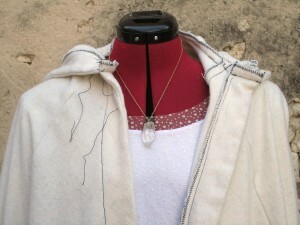 Especially since it has a spell to enchant its robe and make it luminous to protect himself. So I decided to make a surcoat and removable sleeves that reflect light to mimic the effect of this spell. 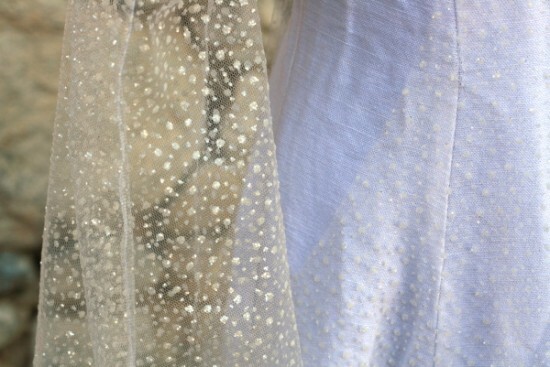 Tulle with small particles that reflect light, purchased at Mondial Tissu. 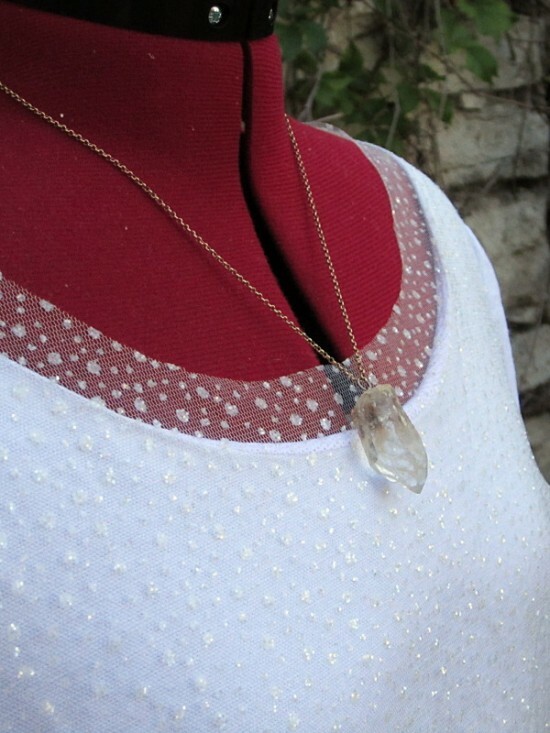 This is not sequins, it’s more like flakes/small white stones. I am very disappointed that the very nice effect that it gives does not translate well in pictures… I have not been able to properly capture it… But trust me on this, in person it is pretty. I was a little afraid to stitch through it but in fact the flakes are soft enough and I had no worries. For the surcoat : I used the dress pattern : taped the front and side front and I cut to create the deep armholes. For sleeves: same, I used the pattern of very large sleeves from the McCall’s pattern but I cut / folded to reduce the width and length. I wanted something more practical than the original sleeves that almost touch the ground. 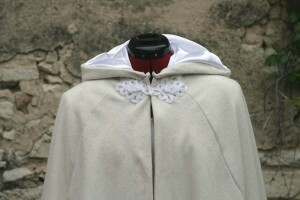 Ben loaned me a white wool hooded cape, saying “you can do what you want with it” … . This cape is a 3/4 circle, it was destined to be dyed, that’s why the thread is black. A cape 3/4 of a circle has a nice size and allows to be nicely covered, it is more comfortable and easier to wear than a half circle cape… But then the hem is sooooo long, it took me 45 minutes of playing with the seam-ripper to get rid of it. – Hide all the black stitching lines inside the hood and cape. 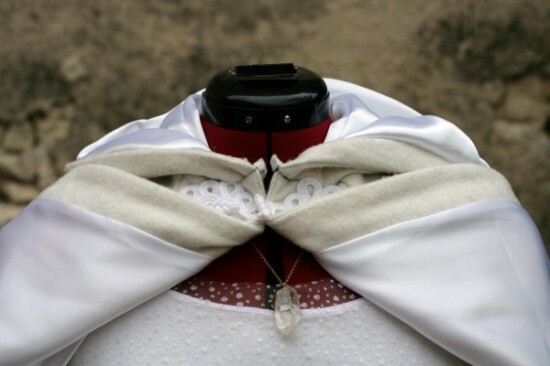 – Make the cape “richer” with a better and heavier hand. For the lining pattern I simply used the cape, put it on the satin lining and cut (4 pieces: 2 for the hood and two to the body). Paying attention to the seam allowances, of course. 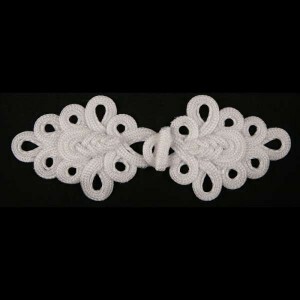 For this I simply sewed by hand a white frog closure 15.5 cm (closed) at the neckline. – Ugly Balls of light to throw… It was my first time and I did not apply myself, it shows! They are weighted foam balls covered by fabric that materialize a ball of light that can be sent on an enemy. – A grimoire, not great either. It’s just a book that I painted, decorated with metal lock ornaments, small shiny stones and a belt loop to close it. – A luminous sugar thingy … In this LAPR, sorcerers can make any object luminous and make it “their flashlight”. And at night this is really useful! 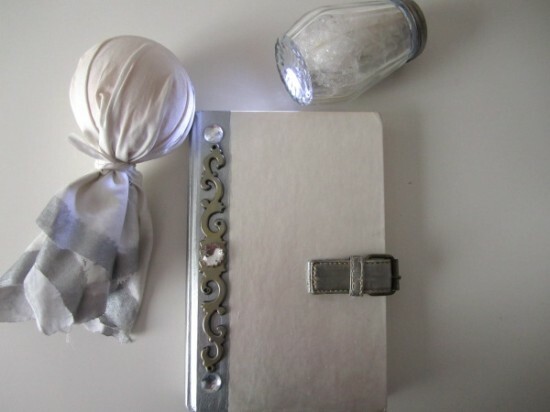 So I used the powdered sugar holder because my flashlight fits in it and I stuffed some of the tulle inside to hide the object. You could tell me that I did not work too hard on this one… It’s true. – And all the usual stuff you have to carry around for a LARP event. A staff would have been nice for this character but I decided not to bother because I know I will find it annoying to carry it around after 2 hours … I already have to carry a big heavy bag. I’ve finished a second costume, but I can’t talk about it yet… Secret. 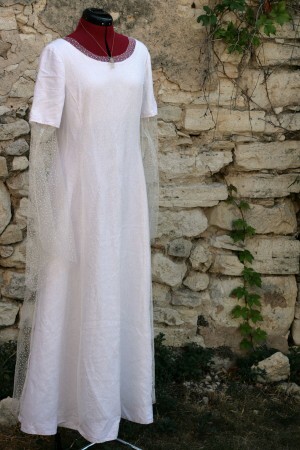 So I haven’t ironed the white linen dress before the photos … That’s wrong! And the first 2 photos are particularly ugly, the fabric effect of surcoat doesn’t show at all. neckline – Ah shiny ! This entry was posted in Blog, Costumes, Sewing Projects by Véro. Bookmark the permalink.